As a functional nutritionist my top recommendation is always to heal your body, your hormones, and your fertility with food first. However, because life happens and we can’t always have total control over what we eat and what nutrients our body absorbs, I also believe it’s important to include specific, targeted supplements as part of a healthy lifestyle, especially if you’re trying to conceive or already pregnant. 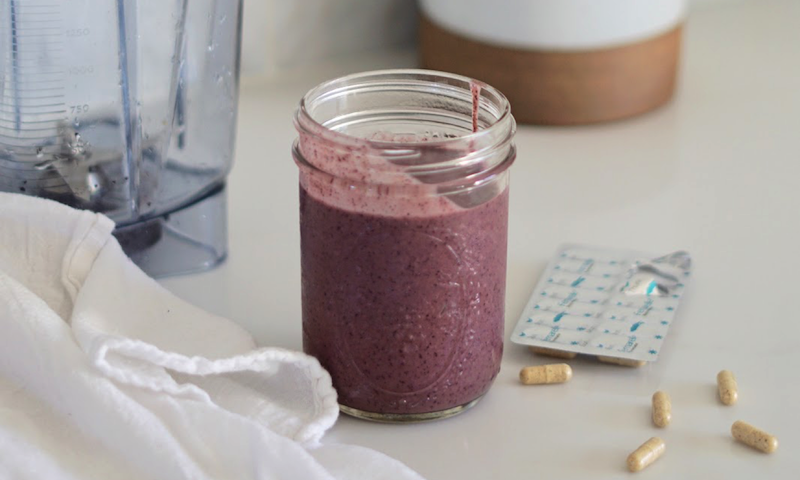 Today I’m going to share the top five supplements I recommend to my clients who are trying to conceive or are already pregnant. But first, I want to talk about a supplement you should definitely NOT be taking … that your doctor may have recommended. If you’ve been taking folic acid, STOP NOW. For a ton of info on why, read my blog on Why You Shouldn’t Take Folic Acid, but the short version is that synthetic folic acid is not normally found in foods or the human body. While it can be converted into usable forms of folate, that conversion is limited, and unabsorbed folic acid blocks receptor sites for naturally occurring folate. An overabundance of folic acid in the body has been linked to poor detoxification ability and miscarriages. Not only that, but folic acid does not cross the placenta like natural folate, meaning that if you do become pregnant, your baby will not benefit from the folic acid you’re taking anyway. Unfortunately, most prenatal multivitamins use synthetic folic acid instead of natural folate because it’s cheaper. The prenatal that I recommend for all my ttc (trying to conceive), pregnant, and breastfeeding mamas is the Designs For Health Prenatal Pro Packets which contain folate in a bioidentical, bioactive form: 5-methyltetrahydrofolate. I recommend starting these packets as soon as possible before getting pregnant. This prenatal multivitamin contains potent levels of all necessary vitamins and minerals that play a part in the intricate processes of the formation of body proteins, structural compounds, chemical transmitters in the nervous system, red blood cells and the developing skeletal system.The earlier supplementation begins the better, because women need adequate nutrient stores to meet the greater nutrient demands of a growing baby. You will continue to take two packets per day throughout your entire pregnancy and post-pregnancy, especially if you’re breastfeeding. PrenatalPro multivitamin: this prenatal multivitamin contains high levels of all the necessary vitamins and minerals that play a critical part in the development and formation of baby. I love this prenatal because it contains the correct form of each nutrient so your body can actually properly absorb and utilize the nutrients. Often prenatals (and standard multivitamins) are using cheap forms of the nutrient which basically means you can’t even absorb the nutrients for use in the body! Prenatal Pro also includes NatureFolate, the methylated form of folate which is always advised in place of synthetic folic acid. Seafood contains a long-chain omega-3 fatty acid called DHA. As a matter of fact, DHA is exclusively found in seafood—you can’t get it anywhere else in the diet. DHA is the most important of the omega-3 fatty acids, and is incorporated into the rapidly developing brain during pregnancy and the first two years of infancy, concentrating in the grey matter and the eyes. It’s also crucial to the formation of neurons, which are the functional cells in the brain, and for protecting the brain from oxidative damage. There’s a large body of evidence supporting the importance of DHA during pregnancy. In countless observational studies, positive associations between maternal DHA levels during pregnancy and behavioral-attention scores, visual recognition, memory and language comprehension in infancy were found. Unfortunately, Americans on average consume only 5 ounces of fish per week, and up to 14 percent of women of childbearing age consume no fish at all – despite the fact that DHA is essential to proper brain development. So especially if you don’t eat fish (and even if you do!) make absolutely sure you’re getting plenty of Omega-3 in supplement form. Start taking a probiotic now! There are possible complications associated with pregnancy that may require you to take an antibiotic, which can destroy the microbiota in your gut biome. Taking probiotics will not only help replace your gut flora if that happens, but a healthy gut biome bolsters your immune system, which may prevent you from contracting an infection requiring an antibiotic in the first place. A healthy gut flora also helps cultivate, preserve and protect your baby’s microbiome. My favorite probiotic is MegaSporeBiotic, a broad-spectrum probiotic blend of 5 Bacillus spores that have been clinically shown to maintain healthy gut barrier function and overall immunity. (Click on REGISTER in upper right corner, then click PATIENT, then enter code SJS2018 when asked for Patient Direct code to order). Start with 1 capsule daily and work up to 2 capsules daily over a 7 day period. Continue on 2 capsules per day. You can additionally use probiotics in the form of a vaginal suppository a few times weekly while trying to get pregnant—insert the capsules at night before bed; they will dissolve while you sleep. Studies show a significant correlation between low Vitamin D levels and low fertility. One study measured vitamin D levels in women undergoing IVF and found the odds of pregnancy were four times higher for women with high vitamin D levels compared to those with a vitamin D deficiency. Another study found that in the group of women with the highest vitamin D levels, 47% became pregnant, while among women with low vitamin D levels, the pregnancy rate was only 20%. Another more recent IVF study revealed a higher fertilization and implantation rate in the group of women with higher vitamin D levels. Healthy vitamin D levels also dramatically reduce the risk of gestational diabetes, preeclampsia, and high blood pressure. You will also feel happier, calmer, and more in balance when your vitamin D levels are in the optimal range of 50-80 ng/ml. Not only does magnesium allow the body to absorb calcium, it also regulates the pituitary gland, which in turn regulates hormone levels. The pituitary gland regulates the production of FSH (follicular stimulating) and LH (luteinizing) that in turn regulate the production of estrogen and progesterone. When you’re not getting enough magnesium, your body will produce less of the hormones that keep your reproductive system in good shape. Boosting your magnesium can help to heal PMS, PCOS, adrenal fatigue, and many other hormone-cycle related health problems. Magnesium is also incredibly helpful in promoting a good night’s sleep. And the great news is that once your magnesium levels are balanced, the positive changes happen fast! In addition to taking the supplements above, it’s important to also eat a nourishing diet of whole, real foods that you cook yourself, get outside and move your body every day, and reduce your exposure to toxins as much as possible. For more information about exactly how to do that, AND a solid plan of action, check out my 12 week online course, The Fertility Code! Looking to have a more in-depth conversation about the supplements to take during preconception and pregnancy? Schedule a consultation with me!